Application Map is a visual layout of the dependency relationships of your application components. It overlays KPIs such as load, performance and failures, availability test failures, and presence of active alerts to help you get to the component causing the performance or failure issue. 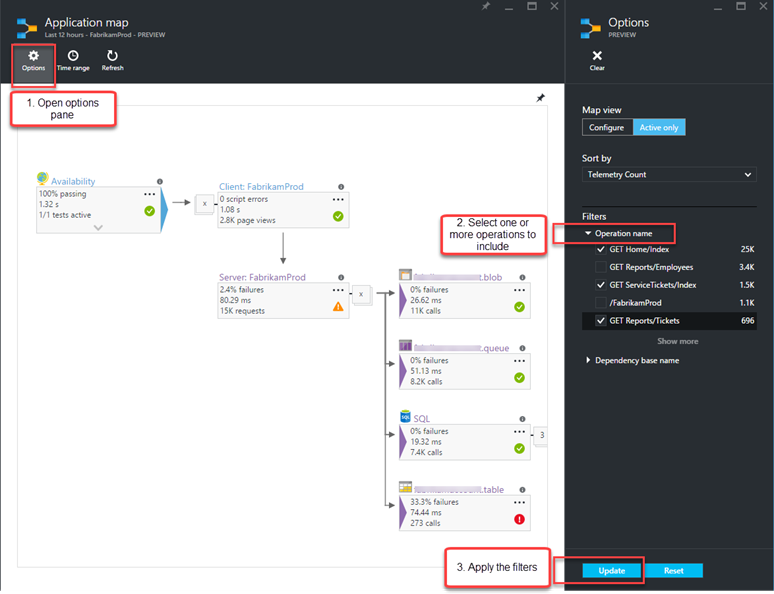 Once you have identified the component needing attention, the map helps with handy in-context links to further diagnostics with Application Insights, to the alert rules, or to diagnostics provided by other Azure resources, like the Database Advisor recommendations by SQL Azure. You can learn more about Application Maps here. You can also filter by Dependency Name, for a filtered view of the KPIs of those specific dependencies. You can drag the map canvas to move it around and focus on a specific set of nodes. This works on both the pinned part on the dashboard and the full map experience. You can resize the map on a dashboard; the nodes will react to the size of your choice. You can click on the nodes in the pinned part on the dashboard to directly get into specific diagnostic options in a list, without opening the full map. As always, we truly appreciate your feedback via the in-portal feature (find the smiley face in the top right area) or through feature requests/votes on our uservoice.